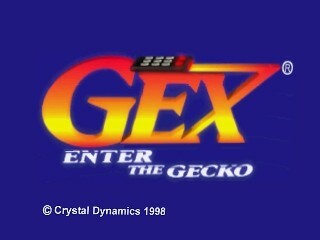 Gex: Enter the Gecko is a 1998 platformer for the N64 and PS1 featuring the titular gecko Gex. Chasing his nemesis Rez through the Media Dimension, Gex encounters a plethora of movie and TV references that surely seem rather dated by now. Best time: Single-segment 0:57:26 by Dominic 'exe' Lenze on 2013-12-09. After one year of grinding, I've finally got a run, that I'm happy with. Thank you to my Fiance who supported me in the past months. Thanks to andypanther and Portalz for finding many cool tricks and for helping me with routing the game. Also thanks to all viewers of my Livestream, who have followed/watched my channel for this long time. You need 33 out of 35 Remotes to activate the Final Boss Rez. You must disable the voice, because it wastes so much time to have it on. Gex says a little sentence three times: Before he enters a level, at the start and at the end of a remote. I found out a new shortcut at the end of the first Remote. You can shortcut over the stones. I performed a Tailbounce on the street because of avoiding the "Tailbounce Bug" on the stones. You can hear that the sound of the TB appears but he doesn't perform a TB. With this earlier "fake" TB I'll have no problems with a TB on the Stone Shortcut. The other remotes went good so far. I've found a cool shortcut on the knights near the end of each remote. You can shortcut a little part of the room by jumping on their shoulders. In Remote 1 there is an another very cool glitch which was found by fergbot. It's the Elevator Skip. You must switch the camera so that you doesn't look into the room and then you can skip the elevator most of the time. After leaving the elevator there is still a little broken part of a cutscene so Gex stopped axiomatically and I get control after this. The seconds remote was very good and I combined the Knight Jump with the Firefly to Shortcut a larger part of the area. This is the N64 exclusive level. I discovered a trick in the first Remote in the main hall of the Titanic. You can shortcut the whole room by performing a direct jump on this ? ?slope thing??. The Jump part at the end of this remote is really tricky and the camera angle is bad as hell. But it works good enough on this run. This bossfight is really easy. There is a pattern which works 100%. Ok, you can have bad luck so that the guy in the middle jumps over the blue ball and this fail results in a destroyed run. But this is very rare. The first Remote is very short compared to the TAS strat. On the bridges at the end I used a trick that I called "exe-shift glitch". With a firefly you can jump from the one bridge to another. But then the button is not active. So you must leave the room and reenter it to reset it. On the seconds remote i had bad luck. Normally, when you climb up the wall after the knights you must only run to the south to fall fall in the correct room most of the time. But on this try the camera was turned in the different way so i fall in the previous room. You can see that i fall into the correct room on the retry, because the camera was correct here (like in near 100% of the trys). I used the same strats on remote 3 as on the first remote. Both remotes are straight forward and there is nothing to say about it. The Jump part in the first remote is a little bit tricky but it's all about practise. The whole level was played well. With the thanks of Mecharichter, the first Remote is in the speedrun. There is only 1 remote in MTT in the TAS. Mecharichter found two cool Skips in this normally very long remote. The first skip is the Shield Jump after defeating the guard. The other skip is a trick near the end in the room with the red ninjas. With a precise jump along the wall you can jump on this climbing wall. The second remote was good. I got hit by the blade but that's not a big problem, because the alternate to this is to wait a little bit. Compared to the TAS you can do this fight a lot faster. The KarateKick/ Long Jump have invincible frames so you can jump through pork. With this trick the fight is very fast. The first remote is on of the hardest in the game. The boat skip is easy but the part with the cubes is really tricky because of the very bad camera position. I've found a shortcut on the door, so you can skip over a half of this area. At the end of the remote there was my first personal major mistakes. You can shortcut the tree by performing direct jumps on each branch. But I jump too far so I fall of and lost ~10 seconds on this. Both Remotes were near perfect. On the first remote there is a Long Jump in the middle part where you jump directly on this ? ?slope thing?? and if you are too close to the edge, you can't perform it. The other remote is easy so now problems here. The first Remote was perfect. On the seconds Remote i found a shortcut at the end, but this went very unlucky on this run. I tried to skip the last part of the volcano by performing a tailbounce on the volcano but Gex slipped down. I hadn't enough speed on the retry and the slowdowns make the time higher too. I lost ~11 seconds here but still safe 3-4 seconds compared to the normal/old way. I've found two skips on this level. The first one on each Remote is in the room after the first elevator. There is a trick I named "Super Tailbounce". By performing a TB on a green jumping platform you can directly re-do a TB on the next edge when you mashing A at the pixels of this edge. This trick copies the high jump ability from the jump platform to the next edge. The second trick is in the room when the ways are splits for the different remotes. You can shortcut the whole room bye performing a tailbounce on the purple platform. So it's possible to jump directly to the two robots. One of the last Skips I've found are the major skips in the first two remotes. By using the Icy Fly you can directly jump on the platforms with the TVs. The last Remote is easy and nothing to say about it. On this bossfight it's possible to get a buggy bonus bit on each round AFTER Rez is falling to the ground. I thought a long time that this bonus hits are random. But a few weeks ago I saw how this works. It's important on which point of Rez jump the buildings collapses. You must destroy the building right before Rez is landing on it. If you do it too early, Rez wont fall off the collapsing building and if you do it too late, he lands completely on the building and you can't do a bonus hit after he falls on the ground with the collapsing building. This is the hardest level in the game and each of this remotes is very hard in itself. The first Remote is really short with a help of a very risky trick. It's the Swing Skip. I've practised this Trick over month and found a good pattern for me. There is no trick in the game that I've practised more then this. You can save over 45 seconds with it an so it's worth to do it. In the first month on speedrunning Gex, this skip destroyed over 50% of my runs and it's a late part trick. But with my personal setup it works so much better. I missed the Guard Glitch after the Swing Skip. This was the first trick i found out. You must jump along the platform on the correct angle so that the shuriken flies to the left door and destroys it (It's only possible to destroy the left door and i don't know why). I thought that i had the correct angle but it wasn't good enough. I lost ~7 seconds because of this, but I saved ~2 in the later part because when you do the Guard Glitch you must wait for the blades and spikes in the late part of the remote or you get hit by them. On this run I can luckily jump through it. On the seconds remote there is a trick I found out after this "Rotating Plattform Shortcut". You can rejump on the gong to directly rise up. The last remote is hard on the beginning but not so hart at the middle part and the end. The only thing that I must told you. is that you must wait on the rotating platforms before the last elevator. If you try to shortcut this last jump, the elevator won't be activated. The second hardest level in the game. On the first remote there is a very hard jump section at the end of the level. The camera is so bad on this point and you must jump very carefully. Reese found a cool shortcut on the second Remote. You can Shortcut a large part of the area by performing a Long Jump to the first crystal. I've found a new setup for this which makes it a lot easier. The Last Remote is very cool and maybe the most freaky remote in the Game. Reece and I found many little skips in this route. He tested out where the platforms comes and goes, so that you can use this to travel faster. I've found the major skip right before the remote. The first phase was very fast so we come to the seconds phase and the big big problem with this game. Rez' seconds phase is completely random! This fight destroyed over 80% of my good runs in the past because of very bad luck. This bossfight wasn't lucky too this time but it was the first run that was executed well in the previous sections. It's a hell of a thing to get a good executed run WITH perfect luck on Rez. The first two rounds are not a big problem because he's doing 3 -> 2 Hits from the top. But the last round is the big problem with only one hit (the three useless hits from the side are also a huge timewaster). I've found a trick (Fast Travel Trick) which you can use to reach buttons on the opponent side faster but it destroyed some runs in the past, because then the button often spawns next to me and I jump too far away with the FTT. Another thing is that you must choose to do the FTT before the Button appears. It's only a mindgame thing and so it's not very helpful. As you can see I tried to reach a Button that is next to me but Rez is too slow by turning into the correct position and missed the hit close. You must have very good luck that the buttons spawn next to you. I'll try to improve this run in the future. And when you are interested in Gex Speedrunning you can watch my runs live on twitch: www.twitch.tv/exe_de. You can also contact me there or write in the 3D Gex Games Topic on SDA.